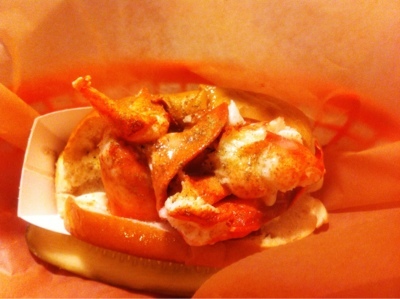 First opened in East Village in 2009, Luke's Lobster has been transplanted to center city Philadelphia. It's a small establishment whose decor, I think, is meant to take diners away from the busy streets of the city and onto the modern rustic feel of a lobster boat. 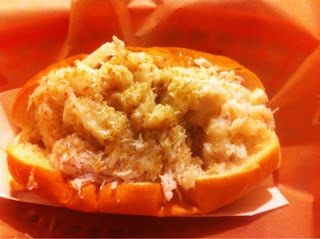 Though it was Luke's Lobster, I've always been a bigger fan of crab, so I got the the crab roll. 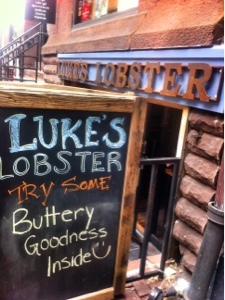 The menu on Luke's website best describes what this is - "seafood...chilled atop a buttered and toasted New England-style, split-top bun with a swipe of may, a sprinkle of lemon butter and a dash of our secret spices." Every bite of the icy, buttery crab was as refreshing as a cold lemonade on a hot summer day. Unfortunately, there wasn't much of the lemonade. The roll is ~4-5 inches, making it more of an expensive ($12) snack than a lunch. Though not exactly budget friendly for the amount of food, Luke's is worth at least a monthly visit.